A closely guarded Feng Shui secret until we revealed the formula around eighteen years ago and now copied by everyone although many still use them incorrectly and for this reason I have written this page to clarify yet again as whilst extremely powerful, if used incorrectly they have a very negative effect. I have personally used salt water cures for thirty years and if set up correctly you can get excellent results and also a fast working cure to combat sickness and bad luck. We use them for the #5 and #2 stars and this year 2019 you would place them in the southwest and northeast but you should also use them on your fixed flying star if you have done your own natal chart. If not, it may be worth considering our software as it calculates the flying stars automatically for you amongst many other Feng Shui formulas. In 2019 the #5 and #2 will be located in the southwest and northeast palace respectively. With the #2 in the northeast palace, this can cause many problems if cures are not placed, the software will come in handy for 2019 and for the next 5 years as it gives much advice on cures and enhancers. In traditional Feng Shui, you do not have to cure every part of the home, if your #2 or #5 star fall in a bathroom, cloakroom, utility or any other less important room you do not really need a salt cure. If it falls in a bedroom, lounge, office or other room that you spend time in you need to set a cure up. Q) Can the salt water cure be covered or placed in a cupboard? 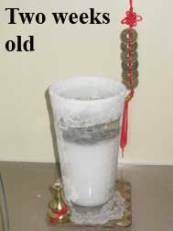 A) No, it must be exposed to the air (qi) otherwise it will not absorb the negative energy, many people place them in cupboards and wonder why the crystal formation is not high, it is because it is not working. Place it in an open area where it is exposed to the air (qi). Q) I really do not want my partner or visitors to my home or business to see the cure, what can you recommend? to the air that is fine. Make sure that you regularly check the salt water cure as it may need to be topped up with water, especially in the summer months. Q) I have read that you can use normal coins to place on top of the salt, is this correct? A) I have clients who have used normal coins without any positive results, so I would advise using Chinese i-ching coins. The ones we sell are superb quality and come from a good dynasty which is very important. The four Chinese characters should be face up, this is the yang side of the coin. 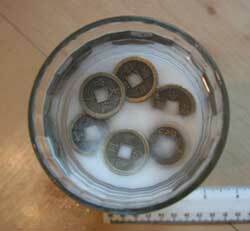 Q) Why do we use six Chinese i-ching coins? without adhering to all of the above. Q) Do you only use a salt water cure for the annual 2 & 5 stars? 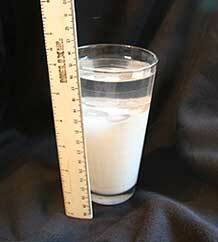 Q) I have been told not to have water in a bedroom; does this apply to a salt water cure? A) A very popular question and one that does not apply, a salt water cure is fine in a bedroom and any other room in the home, if you think about it, it is no different to having a glass of water beside your bed each night. This is called a “yin” water cure. The type of water you do not place in a bedroom is a “yang” water cure like an aquarium of water feature with a pump, the water movement makes it yang and this is harmful in a bedroom. So a salt water is needed in a bedroom for the annual stars and also fixed stars as these cause even more problems to health and luck. Q) How often do I change the salt cure and when should it be placed? Q) What size glass/jar/container should I use? A) We use a normal size pint glass that would be used in a pub. If you are from a country that is not familiar with pint size, this is a container around 750cl in volume. I have copied a photo of our new salt cure below to give you an idea. I prefer to use glass containers and I have many clients who use similar size coffee jars with great results, the pint glass I like as it is the perfect size for the top as it is exposed the air (qi). Q) What will happen if I disturb or knock-over my salt cure? A) This is actually quite common and one that you want to try and avoid, having this cure in a building is like having a bee’s nest in your home or business, it will not harm you if left undisturbed but start poking it and disturbing it, it will sting you. If the salt cure is only a few months old it should be okay, but over three months with a lot of crystallisation around the rim you must renew it as you will have disturbed a lot of negative energy. When you place the cure make sure it will not be disturbed for the time it is there. Also be careful when cleaning around the jar, do not get tempted to pick off the crystals on the rim and do not knock it when cleaning. Q) What other cures can be placed near the salt cure? A) It is good to have metal cures close to the slat cure as these will also weaken the negative earth. Good metal cures are a wu lou, six Chinese coins tied in a row with red ribbon, signing bowl etc, if you follow this link you will see more examples of metal cures. Q) How do I set my salt water cure up? Fill up a glass jar; with table or rock salt to about three quarters full. Place six coins on top of the salt in a circle. Make sure the coins are Yang side up; this is the side with the four Chinese characters. Don’t worry if the coins sink into the salt as you pour the water. Fill the jar to the top with tap water. It would be a good idea to place a mat under the jar to protect furniture or flooring. 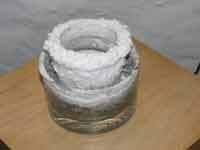 The jar will form crystals over time; this shows that it is working to absorb the negative energy. Make sure the water is always topped up. Do not cover the top of glass/container. The salt water cure should not be placed in a cupboard. Try not to touch or move the jar too much as it stores a lot of negative energy. Remember to place a sizeable mat under the jar / bowl of the salt solution to protect the table that it is on, because in time, the solution will absorb the negative energy and will crystallise around the top of the jar. If the energy is severe, it might spread all around the surface of the furniture. You may wipe around the surface of the table, but do not touch the rim of the jar / bowl at all. Q) How do I dispose of my old salt water cure? A) At the end of each Chinese New Year you should throw your old coins, glass and water/salt away. Because they store so much negative energy it is best to place the whole glass into an old Tupperware type container and seal the top and throw straight into the bin. If you do not have a container pour the water down an outside drain (one at the back of house that leads away from the building) and place the salt/glass and coins into a plastic bag and place in bin. Do not recycle the coins or container, you will be guaranteed bad luck if you do so. Q) I have seen a salt water cure on another website for £55.00 is this better than yours? A) I was sent the link to this website and many others over the years and they are still selling the same cure which is identical in look to ours although the information they give is very dangerous, we sell the salt cures at a very realistic cost to ensure most people can afford them. Follow this link for details on purchase. in by clients or Michael has taken at their home or business. I hope you have enjoyed reading this information. There are many hundreds of pages on this website on information on traditional and authentic Feng Shui. Hi, I put salt water cure about a month ago and noticed that water inside has begun to diminish as the salt builds up around the rim. Do I add water to the cure? Thanks in advance! I would carefully pour water in the middle, trying not to move the salt too much. You can top this up whenever it starts to look like it is drying out. I just pour about 3 quarter full of sea salt into a glass cup amd place it a the north area of my home today. Say if i want to remove it or adjust the placement, is it ok? Do we use hand to touch the glass cup if there is crystal around in the future or how do we remove the glass from the place? When disposing of the salt water cure, you should carefully pick it up and either put it in a tupperware container or dispose of it straight away outside of the home. They are fine to move just after placing although once it has begun to crystalise, I would not recommend moving it. I did not know how to dispose of water cure. I washed out the salt in my back yard, outside a sliding door to our garden. I have pea gravel there and salt cannot harm plants. However, having just read the proper disposal method what can I do now? I’ve put the containers with the coins into a plastic bag for disposal but what about the salt in our garden gravel that has seeped into the ground? Dumb, really dumb move. I would try to dissolve the salt in the gravel with a hose or bucket and keep soaking it away over the space of a few days. If you’re in the UK, the rain will help this. Do not worry about it too much, Terry as the rain should wash a lot of the salt away. I bagua’d our house wrong (used western vs traditional) and placed a saltwater cure on the opposite part of our house (no wonder things have been crazy!). Is it okay to move the cure to the right part of the house or should I just dispose it and make a new one? I’ve only had it a month. If the salt cure is not properly formed with lots of build up around the rim, this should be fine. If it is already quite built up, I would recommend replacing it. The menacing formation is not a nice combination at all but you can place metal to suppress this combination. It is important that this area is kept quiet as a lot of noise can activate this area and cause problems. I would try and keep this area as quiet as possible and hang a wind chime indoors along with some good quality metal such as weightlifting plates. I had my house cleansed by Feng Shui Specialist for the New Year as I’ve had a few bad ones, was told I had everything more or less right just some geopathic stress. (SWCures in N, E, W) Been trying to finish off a fireplace that we decided not to put an iron wood burner in (due to 2018 forecast) in the east, and broke my arm! Is there anything I can do to unsettle the bad luck? There is a fish tank in E/SE next to fireplace. Currently a lot of bricks and concrete applied. Looking to finally rid myself of what seems like constant bad luck. I’d introduce some blue colours into the east of your home for the year and especially while you are finishing off the work here. I hope this helps, Hache. First timer here, I got Himalayan extra fine salt, will that work or is another salt recommend? I’d recommend using normal table salt as I find that Himalayan salt does not form as well. Can you please advise if I should move my bed, as the head of the bed faces Norththe /foot of the bed faces south. It seems the North is an inauspicious location for the year of the dog. However, if I move the bed to the South/facing the North, the bed will be in a bad placement to my bedroom door. I have a spot where the head of the bed will face NW and foot facing SW, is this advisable? You could place your bed in the northwest although you will need to place a Jiang Wu Tai Sui plaque along with an Arowana Fish sitting on a bed of coins to pay respect to Tai Sui and avoid problems. My cure from last year has crystalized now in the south of my living room, and I was wondering how to throw it away I know I can not reuse it has it’s bad luck in Feng Shui… I know this year the 5# and 2# flying stars are in the North and West of the areas. Also my bed is in the West/NorthWest area of the house will I be afflicted by the 5# flying star I have my blue Medical Buddha in the West were the 2# flying star is but I’m more considered about the 5# and the 5# in the centre of the house? To dispose of the salt water cure, you should place it in a sealed bag or Tupperware container and carefully place it in a bin outside of your home. If you have the cures in place in the west such as some good quality metal, six Chinese coins, salt water cure, you should not see any problems here. Wishing you a fantastic year of the Dog, Jess. I would like to ask if we could place salt water cures in the #2 & #5 location of each bedroom (we have 2 bedrooms) so there would be 2 salt water cures per bedroom? So for 2018, placing salt water cures in the north & in the west part of each bedroom? This applies more to an office space or open plan apartment. You would just need to put one salt water cure each in the north and west of your home for the year. Does anybody how to help a pet who might got in touch with salt cure by sniffing or licking? Thank you! I would recommend putting the salt water cure on a high shelf out of reach of your pet as they could knock it or lick it and make themselves ill. This will not be beneficial to your home. You should place a salt water cure wherever you have a #2 or #5 Flying star in your home. For 2017, you should place them in the south and northwest of your home. As of the 4th February 2018, you should place these in the north and west. They should only be placed where the #2 and #5 flying stars are located. If they are not formed yet, you could carefully move one in the south and one in the northwest although I would dispose of the others. Would what would. It happen. To house now. My salt water cure water is starting to turn green, what does that indicate? This could be that the cure has been left for too long or that the water is developing algae. I would definitely dispose of the cure immediately and replace it with a new one. I have 3 Chinese coins on a red ribbon tie, with the four characters on it is that okay to use for a salt water cure? I would not recommend this as you wou need 6 coins to make a salt water cure. If the cure has not been used before and you have two sets of these coins, you could use them. Hi, I have placed water cure 3 weeks ago. In the 1st week nothing formed, I checked the direction again and notice direction a bit out. I adjusted the cure and crystal start forming at the top & bottom of the glass. Do I replace it or leave it till 2018 new year? Sorry for the late reply, I would leave it now until 2018. One more question Michael. Can I place the saltwater cure in the south part of my bedroom (My room is located in the SW portion of my apartment. (My apartment door along with my building door faces W around 275 degrees. The reason I ask is because my relatives aren’t as keen to Feng Shui as I am, so I can’t place the cure anywhere I would like. Though I could really use this cure since this year has been the worst year ever for me. I would not recommend placing the salt water cure in the southwest part of your apartment if you can help it as this will weaken the good earth from the annual #8 star. If you are able to, you could place the salt water cure somewhere out of sight such as behind a picture of in a cupboard. Thank you so much for replying back to my emails. I greatly appreciate it! Hi Michael! I love your website! I’m thinking of making one of these cures. I have some I-Ching coins on a red string, (I think 9 coins) as I will not be able to get any other coins soon, is it okay to cut this string of coins to make this cure? Also have you heard of any amazing testimonials regarding this cure? 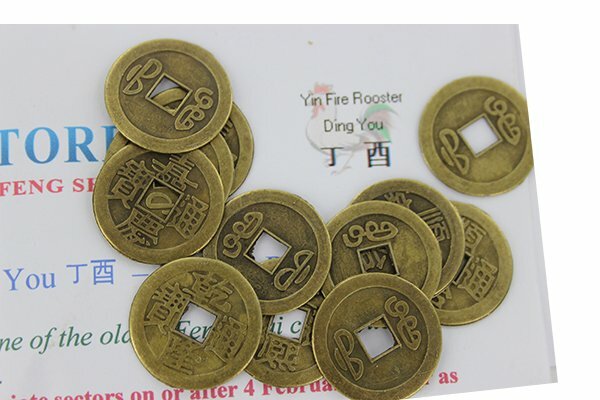 If the coins have not been used before, this will be fine to use them although try to make sure the coins characters look similar to the ones in the image below as these are from a good dynasty. Here is a testimonial from one of our customers about their experience with a salt water cure from our testimonial section. I placed salt water cure in Nw and South.since then still no crystal formed.What does it mean?. Do I have to re place again?my north west is the main door south is the sitting has a window. Crystalisation is a sign of negative Qi being collected. Have you checked that you have set the cure up properly? 75% roughly filled with salt, coins placed on top of salt and then top up with clean water. Be sure to keep the water topped up without moving the cure. hi there! i recently threw away my old salt water cure but the new one i’ve placed doesn’t have any crystals even after 2 weeks. Totally unlike my old one which was forming crystals all over. I do believe that my place has loads of negative energy… could there be anything wrong? I used course salt .. which has some impurities, and all i see are bubbles ard the rim. It is best to use normal household salt that you would use in cooking. I would recommend replacing the cure and using fine salt. Hello, thanks for your great article on salt water cures. I have a question though, what if I place the salt and water without any coin? Does it works? Because my FS master told me not to use coin if nothing serious. How true is that? Another question , I am living in a 3 storey house, so I need to place salt on every floor? And lastly, should be place on the table or floor will be do? Many thanks! I have personally never heard of that as there would be no metal element present without the coins. You only need to place the cures in the most important room over the three levels so for example, if you had a storage room on the ground floor and a bedroom on the first floor in the south, you would place the cure in the bedroom. The cure can be placed on the floor if you do not have a table or shelf present but please be sure to place it somewhere that it wont get knocked. I used the same and the result was really the same as i m doing this since 4 months. Hello, I have set up my salt water cure after purchasing from your store 2 weeks ago. Unfortunately, I misread and instead of 3/4 glass of table salt I had filled up the glass with 1/3 Sea Salt instead. Is that allright. If your cure has began to crystalise, I would leave it where it is. If not, I would carefully remove the coins and set the salt water cure up again. I did not place the salt water cure on the 3 Feb 2017. Can I place it anytime on 2017 or is it better on a specific date? The cures can be placed at any part of the the year as of the 3rd February so I would not worry if you are a little late and as the old saying goes, the best time to do something was yesterday; the second best time to do it is now. Hi, I bought a lot of cures from you (they are still to arrive in the mail in the USA, I’m excited) but I just did my salt water cures for the year of the rooster on my own so I could put them in on the 3rd Feb . The chinese metal coins I had were a bit larger than last year’s so only five fit in a circle and I put the sixth in the center. Is that ok? Or should I do a new salt water cure and get some smaller coins? Thanks for letting me know. A salt water cure is best set in a circle although this should not cause a problem. If you notice that the cure is not forming, I would replace it. You can place a cure in each room if you like although I usually recommend picking the most used room out of the two levels. I would recommend placing the cures across all three levels in the room that is used more in each sector. I set up a cure in a well used room per recommendation on another site. It has begun to ceust and get salt creep and i bumped it today while moving the lamp near it. Should i toss and renew it or leave it alone? Newish to feng shui. Thanks. If it was only a small bit that broke off, I would clear it away and leave the cure as it is. If a large part of the cure broke off, I would replace it with a new one. The annual Flying stars change on the 3rd February so it might be worth waiting until then to place a new one. Hi. Lunar new year 2017 falls on 28/01,. do I set up a new saltwater cure on. 27/01 or 3/02? You would set up your salt cure etc on the 3rd February 2017. My bed is in the location of annual star 2( the center ). I can’t move my bed to other parts of the condo. Can I place the salt water under my bed? I would not use a salt cure under my bed but i would place some really quality metal and better still, if it is round in shape. A great cure is weight lifters weights that go onto the bar. You should a set of six coins tied with red ribbon close to your bed too and of course a wu lou but avoid the salt cure. Hi could you pls help me. Salt water has evaporated and dried up a little. I filled up with water. Just wondering if i could change the salt and re-use the coins and the jar? You should only reuse the coins and jar if they are under 2 months old, personally i would never reuse them. Is it okay to put a small amout of chicken wire around or over one of my salt water cures (still allowing air flow)? The center of our home is the stairs and exposed, only room for a narrow table. I don\’t want our young pets tempted to drink it either. You can put a bit of Chicken wire around the Salt Water Cure although I would recommending installing a small shelf and placing it on there if possible. A floating shelf, brilliant. I currently have it on a round, metal, plant stand, but I like the shelf idea better. Less chance of getting knocked. Thank you. My salt water cure is 3 months old and 90% salt has evaporated . should I refill salt in the same glass. I would recommend replacing the Cure as a Salt Water Cure stores a great deal of negative energy and should only be disturbed when adding water or disposing of the Cure. We are moving but I already have my cure set up. When we get ready to move do I throw it away and set up new one in new place? If you have already set up your Salt Water Cure, I would recommend replacing as they store a lot of negative energy and should not be disturbed until they are disposed of. what is the best way to clean a jar that is overflown by salt. Can i add water if it\’s dry. is it safe placing it under a table to avoid knocking the jar and it\’s in the south part of the house. is it ok to throw the jar and replace it without waiting for the new year. I placed the salt water cure a week or 2 ago and now we\’ve been approved for a new apartment (flat?). How do I go about moving it about without any problems? Does the 6 Chinese coins tied in a row need to be hanging or can it lay on a surface? It is best hung but will still be effective hen laid on a surface. The Salt Water Cures should be placed where the Annual #2 and #5 Flying Stars are which is in the south and centre for 2016. You would keep these in place until they either grow too much to manage or until the end of the Chinese New Year (3rd February 2017). I would not personally recommend it although if you feel it has barely formed, it may be OK.
Can I just leave the Har for the whole year until the next Chinese New Year again? Just yearly replacement is that okay? Yes, you can leave the jar for the year. The only exception is if the Cure is knocked and breaks or if it becomes too overgrown. It would be better on top of a cabinet than a fridge as the fridge is prone to being slammed often. Is it ok to have my cure outside on my porch? This would be fine but make sure it is not in an area where it could get knocked if possible. hi, I unintentionally touch a fund shui frame, the owner says I should not touch it because this will transfer the negative energy and I might get sick, I really don\’t have the intention of holding it it was just I am always fascinated by frames that it very uncommon. When you say Feng Shui Frame, what do you mean by this? A picture frame? Hi, I have been using salt cure in 2 segments of my home since 2014. After reading your article, and referring to my home chart, the segments we are place our cures are different from your prescribed #2 & #5 segments. Is it a must to place them in #2 & #5? Or does it depend on the year when the chart is determined? Thank you in advance. I would personally place them where the #2 & #5 stars are for both the fixed Flying Star Chart and the Annual Stars and this is something that I do in my home. Is it ok to use something to flip the coins over if they get turned upside down when I pour the water in? I did that last year and had some pretty bad luck. Just wondering what to do if it happens this year. I would not recommend it although if you do, please be very gentle as to not break any of the build up around the top. Can i put the salf water cure under my bed? My headboaed is at souteast location facing northwest. I would not recommend it if there is any chance of it getting knocked. If it will be safe and avoid being disturbed, it will be fine. Can I put salt water cure under the table? Yes, that is fine. Salt Water Cures can be replaced all year round. Thank you Daniel for your response. Appreciate it very much. Thanks for sharing your knowledge. Can you please advise me on how to clean up some salt water crystal that had somehow spilled over onto my floor outside the mat I have placed the cure on? If you take a look at the August 2013 monthly updates, you will find a great deal of information on how to improve luck for the month. Where can i get i-ching coins from? I bought two salt water cures from your website and set them up more than three weeks ago. I followed the instructions and I used a jam jar for it. To this day, I have seen no crystallization at all. Also, the water didn\’t seem to evaporate at all even though it is very cold here and we still have the furnace on in the house which usually dries things up fast. What could be wrong with my salt water cure? Please do not worry as this is a very good sign; the Salt Water Cures absorb any negative Qi and obviously, if there is no crystallization, there is very little negative Qi in the area that the Salt Water Cure is placed. I would keep this up and monitor results but this is very normal for some people. Hi as I read on other website that 6 real copper coins, best is to choose the ones that have a royalty on it like the Queen, are also effective like that of 6 chinese coins, is it true?? I would not personally recommend this as this will not have any effect. 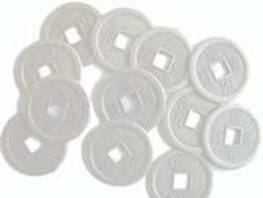 It is always best to use Chinese I-Ching Coins and make sure they come from a good dynasty as this plays an important part in the Cure. Can a metal pie tin be used instead of a glass jar? It is best to stick with a glass jar or maybe a plastic jar if possible.